After I published the previous "Thank You, Marcus Lattimore" blog post, I assumed it would add some form of closure to this ordeal for me emotionally. I was wrong. The first five hours it was on the internet it got read by over ten thousand different people. To no one's surprise, many folks shared my feelings about Marcus. If you haven't read that first blog you need to do that in order to put this one in the proper context. Do that by following this link. I wrote the piece not knowing whether Marcus or his family would ever read it. I actually assumed they probably wouldn't, and haven't heard anything to lead me to believe they have, so that didn't affect me. I wrote the piece for my own pyscho-therapy. Part of me truly felt like if I put in writing my inner most feelings about Marcus Lattimore that it would somehow make my heart stop hurting for him and his family. It didn't. It did, however, create something all together different inside me. It created a mission! A mission to organize the Gamecock fans into action. Here is what I am thinking. For the sake of this article I will keep these numbers simple. 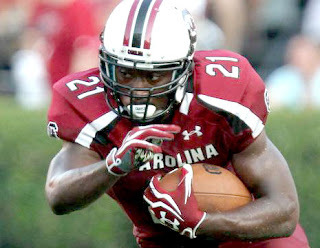 Let's pretend there are 40 weeks worth of work outs between now and the next time Marcus Lattimore can actually practice football again at full-speed. I made these numbers up because no official report has been published as to the extent of Lattimore's injuries yet. But for the sake of this article let's assume 40 weeks. Therefore, that leaves us 200 work-outs between now and the next time Marcus can actually practice full-speed. (Again, these are hypothetical numbers at this point, could be more could be less.) My thought is this. Can we divide these 200 work-outs between the 80 thousand some odd folks who regularly attend the games and help encourage Marcus by actually showing up and cheering him on? My thought is if a church group can organize three full months of hot cooked dinners for parents of newborns, then certainly we can organize how to attend Marcus Lattimore's rehab sessions. That fan, or group of fans, then makes a few posters and bakes some healthy protein cookies or something. They attend their workout in a small private group escorted to the rehab session by a University staffer. They spend five to ten minutes getting pictures with Marcus before and after the work-out. During the work-out they clap and cheer for his weight-lifting or his running. That's it. This happens five times a week for Marcus and he feels Gamecock Nation behind him during his recovery. We then form a facebook page dedicated to only these visits so the pictures can be posted and comments placed on them to encourage his family back home. The facebook page could also serve as a reminder if Marcus ever gets frustrated. Obviously, logistically, a few million things would have to happen between now and the first organized session, but what do you think? My thought is the only problem we would face is that we would have far too many people wanting to do it than we could handle. If that is the only problem we would face, then I vote for trying to make this happen! I will admit I have no connections that could pull this thing off, but you know what I do have? Zero pride or fear walking up into the offices and trying to talk to someone. Especially if I have the backing of my blog website with hundreds (or even better, thousands) of comments backing me up. So what I need from you is for you to pass the article along to folks who you think would be interested in signing up for a work-out session. Get them to post a comment here about it. If enough folks post comments here, we might be able to build enough momentum to actually gain a meeting of some sort with the athletic department. Who knows? All I know is the thought that Marcus would know he's not alone helps me start to see the horizon for him and his family and that makes me happy. As I finished typing this blog post, I started thinking about the implications this would have on the other team members who were also going through rehab on their injuries.What I immediately thought was they could work out during the same sessions and therefore the audience in attendance would get to cheer on everyone who was doing rehab that session, and not just Marcus. Either way, I think it's a great idea and worth pursuing. I am interested in your thoughts, so please leave comments below. Spurrier has duped the local and national media yet again. Why do the reporters all get tricked into this bait and switch every time it happens? I will tell you why. Because they are like sharks swimming around a bloody carcass, and cannot help themselves. It's in their nature to chomp on that carcass and they can't help but do it. Coach Spurrier knows this and uses it to his delight whenever he sees fit. What I am focusing on is how easily Spurrier is able to wield his jedi-mind trick powers over every single media outlet on the planet. Sports talk radio, newspapers, blogs, network television websites, national news organizations, are all buzzing this week about the "whiny Coach Spurrier needing thicker skin." Those media outlets can't get enough of it. They are all romantically united in this stance against the all-powerful Coach railing against one of their own. And this is EXACTLY what Coach Spurrier wanted to happen. We have seen these tactics before, and evidently, Coach Spurrier realizes they will always work, so he keeps using them. Coach Spurrier would rather the pundits talk about his need for "a thicker skin" than bombard his players or assistant coaches with questions about the upcoming opponent. He wants his team singularly focused on beating Georgia, while he diverts all the distractions upon himself. If you don't believe Coach Spurrier picks and chooses when to do these types of things, just take a look at exactly when they have all happened in the past. "Free Shoes University" was just before the championship game against FSU. The "echo of the whistle comments" were before the same game. The Phil Fulmer comments were always before big games ("Can't spell Citrus without UT.) The last Ron Morris debacle was the week Garcia was kicked off the team. Spurrier creates these distractions on purpose when he chooses to. Why is it not obvious by now? The extraordinarily entertaining part to me is how all the "media folks" are so up in arms about Spurrier's behavior. They are all crying about how Spurrier needs to grow up and treat this situation with more dignity and grace. They are clamoring about it all over the interwebs. All the while, failing to realize they are indeed acting exactly like that which they criticize, and are doing so at the beck and call of the mastermind himself. Continuing the irony, the national media pundits are all saying Coach Spurrier needs "thicker skin." To that I say, THE NATIONAL MEDIA needs thicker skin. All the national media outlets who are publishing articles saying Coach Spurrier should just ignore Ron Morris' comments are all being giggled at behind closed doors by Spurrier. The truth is, THEY should be ignoring Spurrier's comments but they are physically incapable of doing so. Spurrier knows this! If Spurrier hadn't pulled this stunt, every article would be headlined with something like, "Biggest Game Ever at Williams-Brice." Gamecock players would be reading those headlines and become distracted by them. Instead, they get to plan for Georgia like business as usual. Business as usual at South Carolina means their coach is ornery about some local media idiot as that same coach yells at them at practice. To all Gamecock players this just feels like a normal game week. And one last note in regards to what Spurrier is pretending to be upset about in order to shield his team from getting distracted by the over hype. I realize I am not a professional journalist, so I don't understand how all the ethics of journalism work. I am just a comedian. Can someone please explain the particulars of how it all works? Am I allowed to just say whatever I want to say, and then if it turns out to be a lie, apologize for it the next day? Is that how journalism works? Do "columnists" get to lie then apologize since they are not "reporters?" I am confused. But unlike any media pundit who has published any article this week about Spurrier's comments instead of the magnitude of the upcoming game, I am NOT CONFUSED. Spurrier didn't dupe me. I saw it all happen first hand and loved it all. Just like I did all the other times. And if you are not convinced Spurrier does these things on purpose effectively, ask yourself what you remember about the last twelve South Carolina games. Is it the fact that we are 11 and 1 during those twelve games, or is it that you remember Spurrier railing on Ron Morris the week Connor Shaw took over the Gamecock's starting job? Of course you don't remember that because nobody cares about that stuff later on. You remember the WINNING not the whining. Spurrier knows this and continues to WIN, while he continues to whine. Later this year after the Gamecocks have won more than ever before, no one will care that Spurrier was a little whiny after the Mizzou game. Those same reporters will vote him SEC Coach of the Year for the umpteenth time. 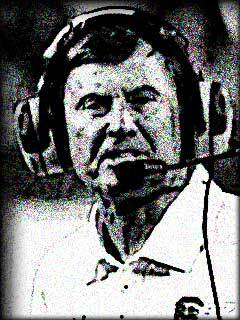 All the while, Coach Spurrier will know he did it all on purpose. Anyone who feels otherwise is just part of Spurrier's master plan.